Team India suffered losses in the T20I and ODI series at home against Australia. While many believe that India’s World Cup preparations are dented, the Indian captain Virat Kohli is still positive about his team. India went with many experimentations in the last 3 ODIs that Australia won but Kohli believes the team was clear about what they wanted from the series. He hailed Australia’s courage to turn things around after India defeated them in their own backyard. The 30-year-old felt that Australia grabbed the crucial moments better than India and hence, they were the deserving winners. However, he refused to admit that there is a need to panic after the loss. “The fact that they came and won here, it had to be a hard-fought series from their point of view. They played better cricket than us and they deserved to win the last 3 games. 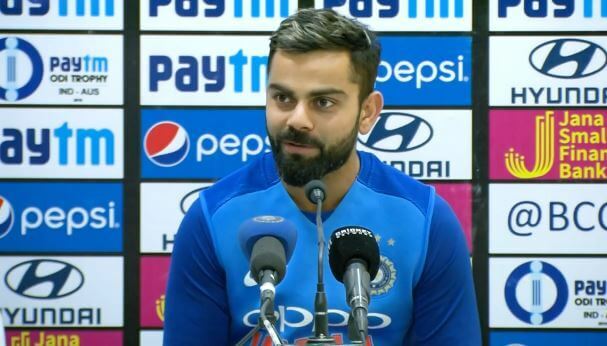 “I think in the first two games, we showed composure but to be honest it doesn’t really feel like something off has happened because we’ve been playing such good cricket and we lost three games out of five-match series where the other team has really been more passionate and been more energetic than us in pressure moments and grabbed the crucial moments in the game better than us and they deserved to win and that’s probably the only breakdown I can give you of the last 3 games. “None of the guys in the change room are panicking or the support staff is not feeling down after this defeat because we know the things that we were wanting to do in this last 3 games, purely because now it’s only the World Cup after this in the one-day competition and as a side, we feel pretty balanced. It’s just that in the pressure moments they showed more composure then us,” said the Indian captain. Kohli went on to say that the preparations for the World Cup are sorted. India will stick to more or less the same side for the mega event in England and Wales. The right-hander opined that the team is ready for the World Cup and just needs to seize the big moments. “Just one spot in the side that needs some discussion. The last three games were all about giving the fringe guys some chances, but that’s not an excuse at all. You don’t need any motivation for the World Cup. All the sides will enjoy the tournament. Full stadiums. We just want to relive the big moments and do well in the World Cup,” added the skipper.